Fifty years ago, production of the 57mm AA-Gun R-10, whose development had begun by the end of WWII, ended in Czechoslovakia. In March, 1944, the occupation authorities sent representatives from Skoda Pilsen to Brno to study the automatic function of a developed 30mm AA gun. This system was to be applied to a new AA gun in 50mm calibre. Work on the project continued even after the end of WWII for export purposes. Skoda set target values of a ceiling of 8,000 m with a muzzle velocity of c.1,000 m/s and shell weight of 2.5 kg. The weapon was developed in 55 mm calibre, which indicates a connection with wartime experiments as this calibre was used by Germany (for example in the 5.5 cm Gerät 58). The Czechoslovakian Ordnance Board showed interest in this gun and at a meeting on April 10th, 1947, the Skoda works were tasked with developing the weapon in 57mm calibre, a change which can be seen as an attempt at standardisation with Soviet calibres. On June 10th, 1947, the nationalised Skoda company was authorised to manufacture a test barrel, but the official requirement was not specified by the Artillery Command until March 4th 1948, when a 57 mm cannon with automatic loading that would be able to engage targets up to 300 mps velocity (1,080 kph) and altitudes up to 5,500 metres was asked for. In the meantime gunnery tests were performed including aircraft being fired upon from weapons of 30 mm, 37 mm and 40 mm calibres, as a result of which 57mm seemed too large to the Army. Thus the first major changes appeared in the weapon‘s history as in July, 1948, Skoda was asked to change the calibre to 50 mm. Skoda, however, managed to push the original 57 mm calibre through and in September 1949, this was accepted by the Army. Three main variants of the weapon were initially developed, differing in the mounting and the loading (by magazines or clips). The first prototype (designated R8) was available in March 1949; this had a cross-type mounting with detachable wheels of German origin (designated 104n in Czechoslovakia). This mounting, which weighed up to three tons, was being favoured in 1948. The ammunition feed was by means of 3-round ammunition clips. The R10 gun had the same feed system, but the cross mounting was a fixed part of the undercarriage, thus the mount was a ton heavier. On the same undercarriage the R12 gun was mounted, but this was to be fed by two 40-round magazines. This raised the weight by another 500 kilograms. In 1950 the R12 was also being considered for a twin mounting (designated R13) or on an SP mount (for example on the KOTRA 8 APC). Independent of the Skoda project, a 50mm automatic AA gun was developed in Zbrojovka Brno as well. Due its to more complicated automatic action, development was ceased in 1950 in favour of Skoda's design. Based on the results of consultations from 9th to 14th March, 1950, the requirements for the gun were specified more closely. Now the required maximum horizontal range was 13,500 meters and ceiling 5,550 meters. The military wanted the cyclic rate of fire to be 180 rpm. Barrel life was to be roughly 2,000 rounds. The carriage unit should be detachable and crew was to be protected by an armoured shield resistant to 7.92mm rounds and splinters. Azimuth and elevation controls should be servomotors with speeds of up to 40°per second in azimuth and 20°p.s. in elevation. Due to this, the mounting needed to have its own petrol engine. The gun should have firing height of 1,050mm and its weight in transport configuration should be 4 tons. For six-gun battery a central fire director with electrical signal transfer was to be developed. For direct targeting of aerial targets with top speed of 220 mps (c. 800 kph) there was proposed a fire director with a circular reticle. For action against ground targets an antitank gunsight vz.47 was adopted. Skoda argued against the high stance of the cross mounting with the German chassis in the R8, so manufacturing of the R10 gun prototype was allowed. In 1950 the manufacture of an R10 prototype on a flatbed chassis was agreed as well. At this time the arms manufacturing was slowly being transferred from Skoda (soon ZVIL Plzen,) to Slovakia, where the project documentation was being developed in Konstrukta Trencin. Due to national unification, the development was stopped in May, 1950, only to be continued by November of the same year. From October 10, 1951, work proceeded only on the non-detachable chassis. The R10 prototype was handed over to the military as late as June, 1952. It suffered so many functional defects it wasn’t accepted. In August, 1952, it failed once again and moreover the weight had risen by a ton. In the same year, the second R10 prototype was produced but both were noted for their numerous defects and were re-categorised to functional demonstrators. Although those prototypes didn’t succeed, under the influence of the tense international situation and the expected beginning of WWIII, production of a 30-gun Zero series was started in 1952. Those were produced without any jigs so ZVIL Pilsen reset the production to just 18 pieces. Six were sent to the 259th Anti-Aircraft regiment in Pilsen, another six to the 82nd AA Division in Jaromer and three were issued to the 83rd AA Division in Brno. The rest was used for various tests. So-called Governmental Tests were held with the two prototypes from October 1, 1953 to January 15, 1954, but they were unsuccessful once again. The delay was caused mostly by delayed ammunition development. Apart from problems with chassis durability, there were defects with the petrol engine and with ammunition loading. The weapon was also remarkable for high unreliability, for example three-round clips sustained only two loadings without the need for recalibration. Thanks to the above mentioned defects the fate of the weapon was very dubious, as in March 1954 the idea of ceasing the development was raised, especially because of its unique ammunition (not interchangeable with the Soviet 57mm). Luckily, the prototype was presented on April 22, 1954, to delegates of the PB UV KSC (Politburo of the Central Committee, Communist Party of Czechoslovakia) and it was decided to award a technological exception for production before the end of the tests. In the original production plans it was intended to build 400 pieces in 1954, 600 in 1955 and in the next year another 200. Due to the various problems just 18 pieces of the evaluation series were authorised in 1954 and these were finished in 1955. Those weapons, as well as another gun produced for trials in the USSR, failed once again. Due to this, PB UV KSC decided on February 7,1955, to try to standardise with the Soviet S-60 gun. A Soviet advisor proposed mounting the S-60 gun on the Czechoslovakian mounting, but this proved impractical. Moreover, at this time Czechoslovakaian experts still lacked precise information about the Soviet weapon and its ammunition. Finally a compromise solution was reached, involving correcting the Czechoslovakian weapon’s defects by the end of January, 1956, plus approval to build 200 guns. The remainder of the guns required would be supplied by means of the purchase of S-60 guns from the USSR. By the end of 1956, ZVIL Pilsen managed to build 200 weapons, supplied with all accessories for a unit cost of 377,000 CSK. Additional costs up to August 31, 1956, amounted to 2,122,893 CSK. Production was allowed, among other reasons, to avoid a loss of 190 million CSK, not to mention the threat of politically sensitive unemployment in Pilsen. However, the other semi-finished prospective projects (R12 and R13 guns), especially the automated battery project, were cancelled by the end of the 1950’s. When compared with the Soviet S-60 gun, the Czechoslovakian weapon appeared to be more powerful and with better prospects for the future. Thanks to a hydropneumatical automatic mechanism a higher rate of fire of 170 to 180 rpm was reached, compared with 110 to 120 rpm of the S-60. After firing approximately 60 shots, the S-60 barrel had to be rinsed, which took 3-4 minutes, while with the Czechoslovakian counterpart it was possible to switch the barrel for a spare one in 30 seconds instead. 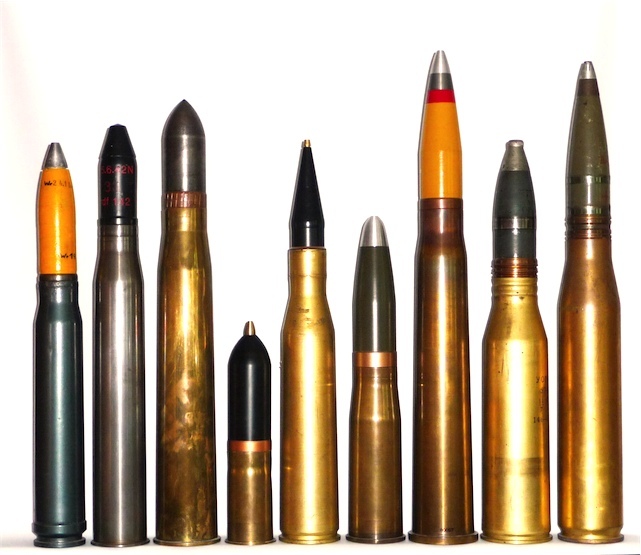 With a target height of 5,000 metres at a distance of 1,000m the Czechoslovakian system was also preferable and the ammunition ballistics were also superior. Especially at the beginning, the Soviet gun and ammunition were considered more reliable though. The Soviet gun had ammunition handling equipment connected with the gun elevation and moreover placed forward of the pointer’s seat. The S-60 had, thanks to more widespread use of light alloy, lower weight and better cross-country mobility, on the other hand it required a more numerous crew. Though it was built for manual handling, at the time of its implementation it already used a central fire direction PUAZO 5 and SON-9 radar, while the planned Czechoslovakian automatic central director AUZ or electronic director EUZ, as well as the radar POHON E, existed only at the prototype stage. Due to problems with development, the use of the PUAZO 4a director from the 85mm vz.44 gun was considered. By 1956 the situation for the Czechoslovakian system was really critical, as with manual handling and only suitable for direct fire, it was on the same level as WWII weapons, though this was at least partially solved later. More photographs of this gun can be seen on THIS site. 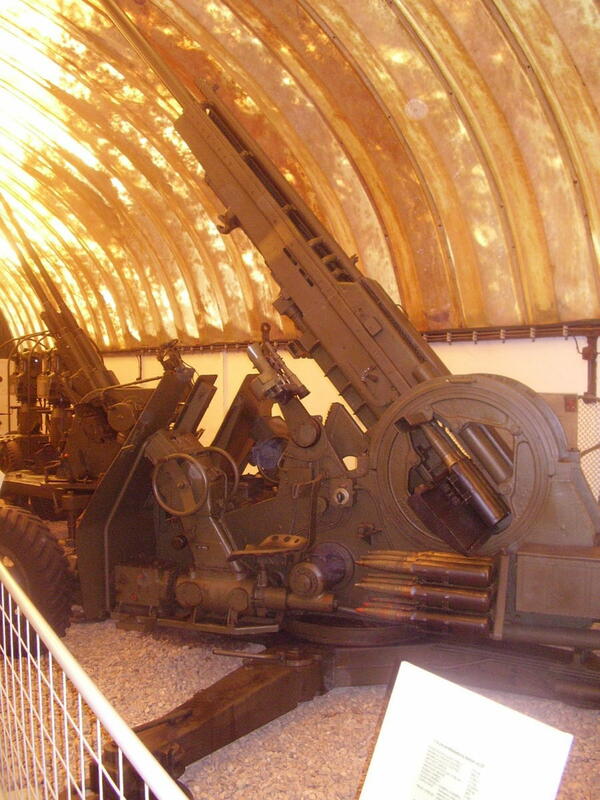 By the end of 1956 an improved 57mm AA gun R10 was designed, and a prototype was produced. The main modifications were that the ammunition loading tray was lengthened to hold 15 rounds; a collapsible loader’s platform and seat were added to the mounting, enabling use of gun when in road configuration; and the drive train from the 100mm R11 gun was fitted ready for the planned system automation. Those changes were planned as an upgrade for the existing weapons, but didn’t take place on such a scale. About the only part of the modernisation which was implemented was an improved AA fire director vz.57/61, also the central fire direction system was completed. It utilised the Czechosovakian radar Pohon E and electronical central director EUZ II; in the battery command car Tatra 805 there was moreover an analogue computer MOZEK I (Brain I) and DJA-6 rangefinder. It’s interesting that the weapon was accepted into service in the CSLA (Czechoslovakian People’s Army) under the designation 57mm AA gun vz.ČS. and the acceptance year was lacking in the designation. In temporary documentation we can find models 1952, 1953 and 1957, what clearly links to the stages of development. The weapons formed the ground forces' AA defence and at least for some time served in the 173rd AA Gun Regiment in Pilsen and in 253rd and 254th AA Gun Regiment of 82nd AA Division in Jaromer. Moreover, the guns were found in batteries or detachments of Motor Rifle division on reduced or skeleton status (basically reserve units). In the full established Tank and Motor Rifle divisions the Soviet S-60 was used. For example in 1962 there were 219 Czechoslovakian and 171 Soviet 57mm guns in the inventory of the CSLA. The weapon was kept in service probably up to the beginning of the1990’s and at the present time many weapons are preserved in military museums. *In contemporary Czechoslovakian terminology, HE shells with impact fuse were designated as "impact shells".